Jennifer Casa-Todd is a Literacy & Lead Learner for 21C initiative at YCDSB. She loves to learn, collaborate, and tinker with tech. Jennifer is also a UOIT grad student. You can find her on Twitter at @jcasatodd. A few days ago, my 15 year old had an interview over Skype for a camp counsellor position. She was extremely nervous, as could be expected, as it was her first interview ever. So we thought of some possible questions together and she practiced how she would answer. During the interview itself, I sat within earshot, for moral support and out of curiosity. I’m not sure why I was surprised when the interviewer asked the question, “What social media are you on and what would I know about you if I looked there?” It wasn’t a question we practiced (a completely ironic lapse if you know anything about me) and I held my breath as she answered. I use social media mostly to connect with my friends. I’m on Instagram and Snapchat. There you will see pictures of me and my friends and know that I value friendship. I also like to take interesting pictures of my work sometimes. I also have a Twitter account. There I mostly retweet pictures of cute animals so you’d know that I’m an animal lover. As I listened to her, I thought to myself, way to go; she was eloquent and put a very positive spin on a question that I know really surprised her. But I also thought about the fact that at 15, she hasn’t really had any opportunities to develop a digital footprint beyond socially connecting with her friends. Nor have any of her friends. And yet, she’s not exactly right either, but she doesn’t know anything different. There really is so much potential for her to capitalize on the use of social media to set herself apart from others. We had a great conversation about what that looks like, but I don’t think she’s entirely convinced because she hasn’t heard this from anyone else and I’m her mom (and thus simultaneously uncool and unwise). I think about how much my thinking has changed over the past two years. Then, I was extremely protective of her name and image and didn’t want it to be anywhere on the internet (out of fear of predators). In fact, last year, when she created a travel vlog, I wasn’t comfortable with her posting it because her face was on it. When she was 9 and passionate about creating videos, I let her create a Youtube channel, but the conditions of her getting it was that she couldn’t use her own name for the account. I don’t regret these decisions because they helped establish norms around privacy and protection. And yet, I wonder if I could have still instilled that same knowledge, without squashing that passion, tempering the fear narrative. Because developing a positive online presence is so important. @ThatHannahAlper (Hannah Alper) uses social media to enpower and inspire–just check out her website, Call Me Hannah to see how she does this. She is also a champion of environmental causes and just recently became a Youth Ambassador for Bystander Revolution, which is an organization taking a stand on bullying. Though Kid President (@Iamkidpresident) gets a little help from Brad Montague, 10 yr-old Robby Novak definitely empowers others through his inspirational videos as well as his own story. He is also a champion for important causes. Currently, you can see him fighting child hunger by following the hashtag #hungerfreesummer or by checking out the video here. Yes, these students are perhaps the exception, rather than the norm right now, but how do we help kids see the potential of social media as a way to develop more positive digital identities and do good in the world? If students are using social media in their classes to share their learning on blogs, Twitter and Instragram, will they realize the immense power it has to connect them to the world beyond the social? How can we inspire kids to become so passionate about a cause or a topic that they are moved to digital leadership? We can’t unless we engage in opportunities to talk about it at home, teach it at school, and model this as adults. I’m sure there are tons of other kids making a positive impact. Who are they and what are they doing? It’s easier to have these conversations if we have lots of examples of kids doing great things. I’ve created a collaborative Google Doc. Contributions welcome! Here’s a resource called, Your Digital Footprint, that Couros recently shared that provides a wonderful starting point whether you are a parent, teacher, or District leader. Check out this amazing sketchnote visual created by Sylvia Duckworth. It was great to collaborate on this with her! Great and timely post. Thanks for sharing. 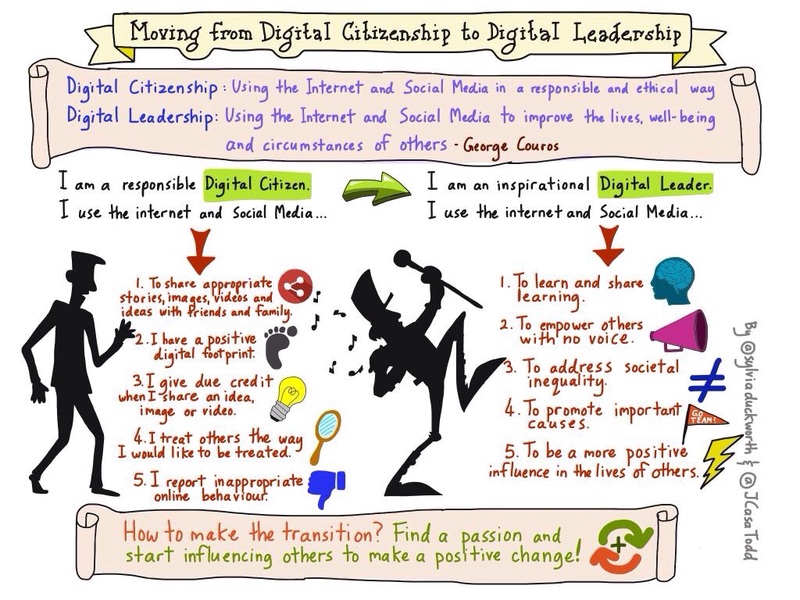 I am preparing to begin a new year of ed tech training and digital leadership and citizenship are both on the top of the list. I like the approach you took with helping your daughter develop her digital footprint. Would you mind if I used your graphic in my training sessions? I will give full credit to both creators. I can be reached on Twitter @MsFagin. Thanks!